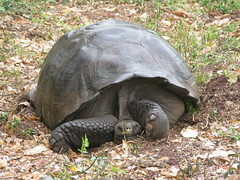 Our last day in the Galapagos! We had an early breakfast and headed to shore at 6:30am. We boarded a minibus and headed towards the airport. On the way, we stopped at a private ranch, which is home to many many tortoises (all wild, not in captivity). We put on some rubber boots and headed for a walk around the ranch. We saw a lot of tortoises, sleeping, walking and taking mud baths. Very cool! 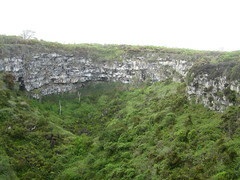 The next stop was Los Gemelos, two huge craters (or sink holes) formed by collapsing volcanic rock. Then it was time to head to the airport. We checked in as a group, which meant one person in our group had all our luggage claim tags. In South America, they actually check the tags on the way out of the baggage area to make sure you have your bags and no one else’s. I was a little apprehensive about this group baggage check approach, but figured it would work out. We boarded the plane and headed back to Quito. It was a bit bumpy and the landing was one of the hardest landings I think I have ever experienced! However, we arrived safe and sound. Unfortunately, our small group was on a plane chartered for another large group that was headed straight for their fancy hotel on arrival in Quito … no need to pick up their bags, because those were being automatically transferred to their hotel as well. We waited, and waited, and waited for our bags to come out, the one native-Spanish speaker (who had all of our baggage tags) went back and forth between departures and arrivals to try to find out what was going on. Finally, they said they were separating our bags from the other group’s bags. And then the bags came! All except two…one of which was mine. After much more discussion with airline staff and calls to the large group’s hotel, and a refusal by us to have the airline pick up the bags from the hotel once they had not been claimed by one of the other tour members, we headed to the fancy hotel and found our lost luggage. Two hours after we arrived in Quito we finally got to our hotel. It was an unfortunate end to a great trip, and mostly the fault of the airline. 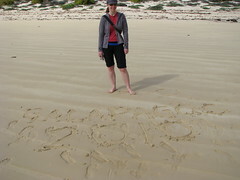 We really enjoyed the Galapagos. The stories and the pictures don’t do it justice. It is not possible to describe what it’s like to be among the wildlife there. The animals rarely give humans a second thought and few have any sort of flight instinct with respect to man. You have to walk around them at times, just to be able to keep on going with the walk. You can stand among 50 sea lions on a beach or beside a giant tortoise, or beside a cluster of 100 marine iguanas without a second thought. The birds are also magnificent. And the sea life was even more amazing – no pictures of that though as we didn’t have an underwater camera (oops!). Our boat, the Archipel I, was really nice. We had no complaints about the accommodations, the staff or the food. It was all great!